Welcome to Jack Oliver’s Pool, Spa & Patio, your outdoor living experts serving Columbia, Lexington, Forest Acres and the surrounding areas since 2006. Jack Oliver’s Pool, Spa & Patio has everything needed for the perfect backyard, including custom pool construction, pool and spa service and maintenance, portable spas and saunas sales and installation, outdoor furniture, grills and more. We take pride in providing our clients with superior customer satisfaction and quality products at competitive prices, and we look forward to you experiencing all Jack Oliver’s Pool, Spa & Patio has to offer. Jack Oliver’s Pool, Spa & Patio specializes in pool construction and renovation. Whether you’re looking to incorporate a custom gunite pool or inground vinyl liner pool, we have the experience needed to bring your dreams to life. Our professional designers will work closely with you to help you choose the right pool design for your backyard and budget. We want you to be able to enjoy your pool for years to come, and that’s why you can rely on us to ensure that it is built with precision and care. If your existing pool is in need of a makeover, look no further than Jack Oliver’s Pool, Spa & Patio. We can completely transform your old and outdated poolscape into a gorgeous, energy-efficient one, bringing it up-to-date with current design trends and top of the line equipment. While pool ownership is a big responsibility, it’s also a luxury, and we want you to be able to enjoy a worry-free experience. Once your new pool or spa is complete, let our service experts care for your pool and spa with a variety of maintenance services, including weekly year-round pool service, equipment installation and repair, vinyl liner replacement and so much more. No matter your pool and spa service need, Jack Oliver’s Pool, Spa & Patio is here for you. The Jack Oliver’s Pool, Spa & Patio team is ready to answer any question you may have about your pool or spa. Stop by our larger location at 3303 Forest Dr. in Columbia today to see what we’re all about. 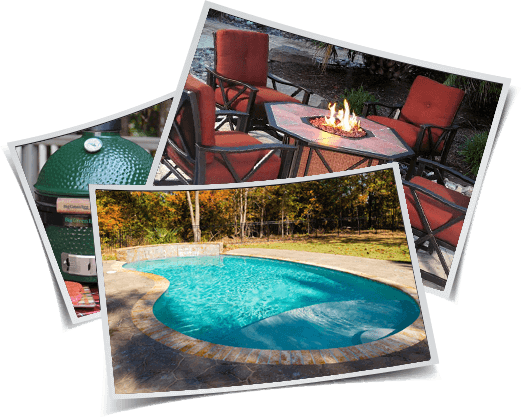 While you’re here, be sure to browse our wide selection of today’s top pool and spa chemicals, equipment, products and accessories, including beautiful outdoor furniture sets, grills, and Big Green Eggs, just to name a few. We look forward to you becoming a part of the Jack Oliver’s Pool, Spa & Patio family and letting us take a small part in the years of fun and memories you will make with your own family in your backyard oasis. Be sure to contact us today! Your pool is designed and built by the experts themselves, and we look forward to meeting with you during AT-HOME consultation to help get started building you the pool of your dreams. Our design and renovation team can breathe new life into your old pool, spa and patio area with a variety of cutting edge techniques to suit a range of budgets. Jack Oliver is your one-stop shopping when you need pool chemicals, maintenance supplies, grills and accessories. Let Jack Oliver enhance your outdoor living space and give you a functional, yet inviting outdoor oasis you’re sure to enjoy in the years to come. Bring your backyard to life with a custom pool and spa, complete with gorgeous materials and eco-friendly equipment. Let us design the backyard pool you've always wanted. By working with the trusted pool professionals at Jack Oliver, you can rest assured that your pool issue will be properly diagnosed and repaired according to the highest standards of quality and service. Get your project started right by browsing through our galleries to see just a small sampling of the Pools, Water Features and Outdoor Living projects we've created. Take note of materials, overall looks, anything that will inspire you for your upcoming project from Jack Oliver’s Pool, Spa & Patio.